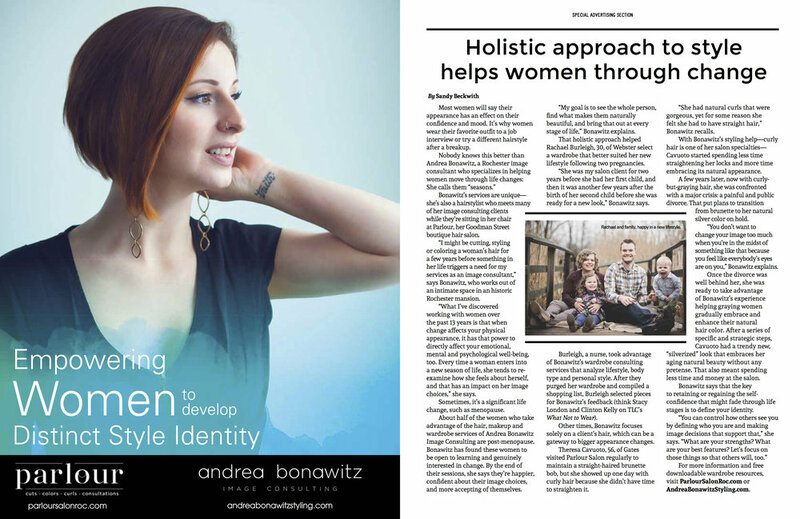 Andrea was featured in Rochester Magazine's October 2017 Fashion Issue for her holistic approach to styling that helps women through seasons of change or identity crisis. It reads, "Most women will say their appearance has an effect on their confidence and mood. It’s why women wear their favorite outfit to a job interview or try a different hairstyle after a breakup. while they’re sitting in her chair at Parlour, her Goodman Street boutique hair salon. a few years before something in her life triggers a need for my services as an image consultant,” says Bonawitz, who works out of an intimate space in an historic Rochester mansion. change affects your physical appearance, it has that power to directly affect your emotional, mental and psychological well-being, too. Every time a woman enters into a new season of life, she tends to re- examine how she feels about herself, and that has an impact on her image choices,” she says." Andrea was asked to be the Keynote Speaker on a Panel about "Minimizing Your Closet," November 6, 2017 for Rochester Minimalists. Andrea teaches quarterly classes through the community education space called The Rochester Brainery. Her classes have consistently sold out since she began in 2014!